Should mean one of Ritchie or Nichushkin scratched. The back half of the season officially starts. The march to the trade deadline is underway. Victory is assured because we're big now. Looks like Nichushkin is the scratch with Hintz and Gurianov in. Remi Elie hat trick tonight, yes? ScubaSteve wrote: Remi Elie hat trick tonight, yes? I’m thinking Rig chucks knuckles to endear himself to his old/new teammates. Another breakaway, another miss. Thank god they rarely go to a shootout. Fedun with an awesome pinch and pass. So smart. 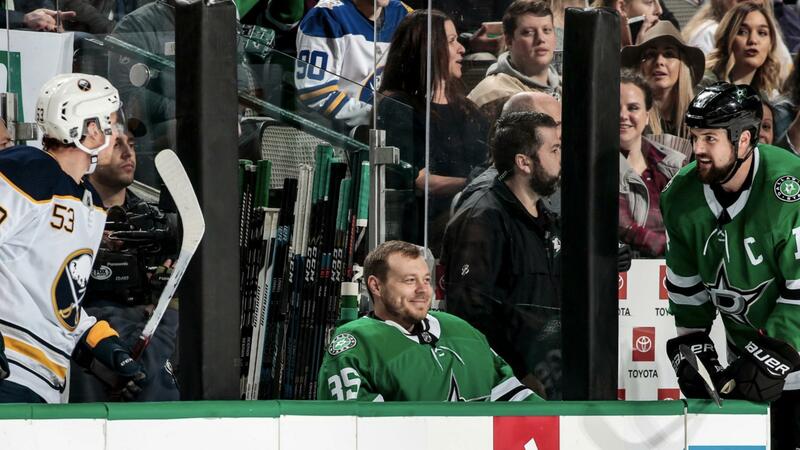 Should the Radulov bobble head by him sitting in the box? Janmark kills a good rush by passing into Seguin’s skates. I don’t know what Janmark did to lose his mojo, but he’s been terrible. Troy McClure wrote: Fedun with an awesome pinch and pass. So smart. He went to Princeton, and is legit smart. Read an article a while back about how he plans on being an engineer, and just did hockey to get a scholarship and pay some bills, and that he never expected his career to last this long. Fedun has a mechanical engineering degree from Princeton. Troy McClure wrote: Janmark kills a good rush by passing into Seguin’s skates. I don’t know what Janmark did to lose his mojo, but he’s been terrible. Yeah, I didn't get why people stood up or got excited when Janmark got that breakaway. We all knew he wasn't going to score. Yeah, I didn't get why people stood up or got excited when a Star got that breakaway. We all knew he wasn't going to score. Two wins in a row and Oleksiak is back. It's clear the Cup is ours. I’m really kind of offended that they didn’t retire Hamhuis’ #2. No,it was Jokipakka’s #2, IDIOTS. Pretty good game. Fast and it had some fun moments. Stars could have scored more but Buf goalie was outstanding. Once again defense wins the game. We’re playing faster and calmer. Also, credit Oleksiak - he looked OK out there. I'd forgotten that, when he's not trying desperately to be Chara because the organization wants him to be, he's a pretty smooth skater and not awful at hockey. Still not convinced he's the best answer, but if he can play like just a big dude who can skate and move the puck in a not-awful manner, I think he's better than the magic beans the 4th round pick would have produced. I'd really like to see a true top-4 defenseman get picked up, but Fedun and Oleksiak on a third pairing isn't the worst pairing in hockey. I hardly noticed him, which is good. I'm totally sold on Oleksiak as long as Todd stops claiming he's awesome. The Frugal Gourmet wrote: I'm totally sold on Oleksiak as long as Todd stops claiming he's awesome. I feel bad for Todd. I really do. I love Todd as a person, but the poor guy is like a cutter. Despite all of the options available to him for happiness, he picks the ones that hurt him. He's the guy who goes to the pound and seeks out the blind, three-legged dog with allergies and tries to train the dog to compete in agility races. He could choose to love super heroes capable of great things like Klingberg or Heiskanen or Radulov, but instead, he chooses to love the handicapable guys like Nichushkin, Honka, and Fistric. Because those guys all rock. There's a reason my indoor soccer number is #28. I was the only other guy on Team Fistric as well. I've even got one of his game worn's. Sigh.